Mental stimulation is NOT the same thing as physical stimulation. Many websites, books and dog trainers preach the religion of “a tired dog is a good dog.” I do not accept this as the truth, and as a matter of fact I feel that this is possibly a dangerous assumption. Dogs that are heavily physically exercised but do not have adequate outlets for mental stimulation suffer from an imbalance…an imbalance that can potentially create larger behavior problems. For example…you take your dog jogging 5 miles every day. His physical exercise needs are met, and met well. But you don’t give him any mental stimulation, and he’s bored. Now you have created a marathon athlete who is BORED and looking for stuff to do to meet his mental needs. He certainly has the stamina to find bad stuff to do now, since he’s so amazingly physically fit! This means he’ll be able to chew up 20 shoes instead of just one! Think about it in a human perspective. I will use myself as an example…I love to read books, watch movies, write, surf the Internet, shop on EBay, paint, talk to my friends, have a few drinks now and then around the fire, etc. Do you think that I could replace the satisfaction that I get from these activates with physical stimulation? Heck no. Try telling me to run on the treadmill instead of watching a good movie! They two don’t even compare. If you took all of the activities I listed above and removed them from my life, isolated me with nothing to do except eat, sleep, and run on the treadmill…I would not be happy, and I would slowly go insane. We do this to dogs all the time, and they slowly go insane as a result. When they start to go insane, their behavior bothers us. We need to offer mental stimulation to have a “good dog.” If we don’t offer it, they will try to get it themselves (and this is where the shoe-chewing, wallpaper stripping, excessive excitability, obsessive/compulsive behaviors start to show up and bother the heck out of us). You do not need to take hours out of your day to provide adequate amounts of mental stimulation. If you begin to provide more mental stimulation, you will probably notice that your dog is more settled, less restless, less hyperactive, less attention-seeking, and guess what? He won’t need massive amounts of physical exercise just to make him tolerable to be around. Balance is key!!! Some of the items below even allow you to kill two birds with one stone (mental stimulation and physical exercise together). ALL of the items below increase your interaction with your dog, as well, and that is always positive. All of the items below increase your control and training of the dog, too. Dog Comes Along: Take your dog with you when you go places. Need to return movies? Take the dog along if the weather permits you to safely leave him in the car for 5 minutes. Return your moves, then get the dog out for 5 minutes and walk him around the parking lot. Every outing you can allow your dog to enjoy is mental stimulation, even if it’s just for 5 minutes! Need to go to the ATM at night? Take the dog along and have him do a sit-stay in the room while you get your money. Checking your mail? Take the dog along, and do some trick practice outside the post office. You can add immense amounts of mental stimulation just by allowing the dog to accompany you wherever you go. Even if you don’t take him out of the car, the trip itself is fun and exciting and offers all kinds of new sights, sounds, smells, and experiences. Plus he gets to be with you. Simply starting to include the dog in your life on an everyday basis outside of the home environment, folks, will make a HUGE difference. Feeding Routine: Get your dog on a twice-a-day feeding routine IMMEDIATELY. Dogs are pre-programmed to work very hard and be very excited about food. If your dog has a food bowl on the floor that he picks at all day, this is BORING. KONGS as meal replacements. Please note: If your dog is not on a proper feeding routine, you cannot use this as mental entertainment. Your dog will not work hard to get the food out. He will lick at it a few times and leave it. If he is on a proper feeding routine, he will work VERY hard to de-stuff the KONG and it is the same as a difficult crossword puzzle or a math problem…after he’s done, he will shake himself, lie down, and probably sleep. This is high-level mental entertainment! Even a very young puppy can easily dissect the beginner-level KONG described below. 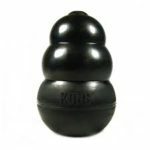 Dogs initially try to de-stuff KONGS by simply licking at them and following them as they are pushed by the licking. As time goes by, however, you will see your dog learning extremely creative and effective ways to de-stuff. Some dogs jam them into a certain corner of the kitchen, or learn how to fix them in place with their paws to dissect. Many dogs actually learn to drop them down stairwells and then clean up the stuff that falls out, or climb onto furniture and drop them to the floor! Because some of the items in a KONG can be messy, please offer the KONG somewhere that you do not mind wiping up if necessary. You can offer KONGS in a crate if you wish. 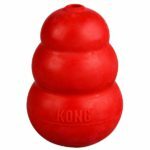 Buy at least two Kongs that are the largest size that your dog can pick up. For most dogs above 15 pounds, the size LARGE is what you will want (about the size of a large fist). Black is the strongest KONG, red is the next strongest, and most other non-brand-name KONG type toys are crap and your dog will be able to rip them to pieces easily. They cost less but it’s not worth it. Offer KONGS as meal replacements as often as possible. Stuff KONGS creatively and offer as meal replacements as often as possible. NOTE: KONGS are dishwasher-safe. Other brands of similar toys may not be. Kibble Hunting: Do you have a fenced backyard or a grassy area where you can be sure the dog will not ingest pesticides or fertilizers? If so, measure out your dog’s kibble in a bowl and go outdoors with him. Throw the kibble into the grassy area, making sure to spread it as far as possible. Sit down in a lawn chair and read a good book while your dog roots around to find each kibble. Can also be done indoors in an area that you area easily able to clean up. Hide the Treat: Put your dog outside or in a crate for a few minutes. Place aromatic treats on the floor, corners of coffee tables, edges of furniture, window sills, where ever you want the dog to be able to access. Spread about 20 treats throughout the room. Bring your dog back inside/into the room and give him a cue. I use “hunt it up”, but this can be anything you want the dog to associate with this game. Once he has found the majority of the treats, quickly hide a few more to keep the game going. Most dogs will continue to sniff he room for several minutes after he has found all the treats. This is a great tool if you have company coming over, or have ordered food for delivery. Hide the Treat will mentally stimulate your dog and tire him out before he can become reactive to the doorbell. Crate/Bed Surprise: If your dog can be relied on not to chew towels, this is a fun method that not only allows the dog to have fun hunting his food, but also can be used to get a dog happier being in a crate. Take dog out of the room and place 5 large bath towels in messy layers in his crate or on his bed. Within the messy layers, hide his kibbles and a few tasty (but dry or semi-soft) treats. Bring dog back into room and allow him to discover the treasure trove on his own (don’t point him at it, that’s too easy! ), and watch as he systematically paws through the bath towels to find every last morsel. Frozen Towel Puzzle: Go to the secondhand store and buy several thick bath or dish towels. Soak in broth, wring out extremely well, and make into long skinny “sticks.” Place treats on the towel and tie a loose knot over the treats. Try to get several knots into each towel. Freeze hard and offer dog OUTSIDE (this is a pretty messy thing to offer for indoors). SUPERVISE YOUR DOG and do not leave him unattended with these items!!! If he is attempting to ingest strings, take it away as this is extremely dangerous. What most dogs do is immediately detect the treats within the loose knots and go to work untying the knots. I repeat, DO NOT give this to an unattended dog! This puzzle is great if you live in a hot climate and want to cool the dog off. Clicker Training: Training your dog to offer behaviors using clicker training is a superb way to offer mental stimulation without worries. A 5-minute clicker session is a “brain drain” for a properly prepared dog. You don’t even have to have a goal in your training! Who cares if you never go anywhere with what the dog is doing? I do this often with my own dogs. It is their absolute favorite activity…they will leave a delicious KONG to work for the click. They will tear down doors if they hear me working with another dog! Click here for how to clicker train your dog. Teaching Tricks/Obedience: Teach dog a number of silly tricks and functional obedience behaviors like sit/down/stay/stand and then ask the dog to do them throughout the day when they want something like petting, going outside, leash walks, ball games etc. Teach a variety so that you can ask for different things, always keeping the dog guessing what’s next. Taking Classes: If you can manage to take an obedience, agility, flyball, frisbee, herding, lure coursing, rally, or any other type of regular training class, do it! Even if you don’t need to “learn” anything, your dog will get MASSIVE amounts of mental stimulation from the activity. Doggie Buddies: Find a friend who has a nice dog, and arrange for a 30-60 minute play date once a week. Try to go for a free run/woods-walk with the playmate so that the dogs can sniff out bugs and mice and read the pee-mail and leave some of their own. Retrieval games: If your dog likes to play ball or frisbee, add a “mental component” to it by asking the dog for a different obedience behavior or trick before each throw. Then, throw the item creatively…sideways, out front, backwards, straight up in the air, long, short…keep the dog guessing. A good enriched retrieval session of 5-10 minutes can leave the dog mentally satisfied and physically exercised (and plus, you don’t even have to walk…I’m lazy, can you tell?) You can do retrieval games with dogs that do not have a good recall by using a long line/Flexi lead, or by going to a ball diamond or tennis court. For extra exercise, get a Chuckit and really fling that ball! Busy walks: Take your dog to a busy area and hang out for 15 minutes. The Wal-Mart parking lot, a softball game, a town fair, any outdoor event is super. If you live in an area where there is a large pet store that allows dogs to enter that’s great too. The sights, smells, and interaction with people are all new and interesting items for the dog to take in and will mentally exhaust the dog. If your dog is anxious in environments such as this, please start remedial socialization and use less challenging environments at first. Liberally smear anything spread-able over the entire interior of KONG (peanut butter, cheese whiz, cream cheese, liverwurst, last night’s gravy). Stuff a layer of the dog’s kibble, pack in hard. Drop in something delicious such as cheese, treat etc. Continue layering kibble/treat/kibble/treat/etc until you fill KONG to top. Use your knife to pack in HARD! Turn KONG over and shake. If something falls out, pack in harder until you can shake it and nothing falls out. Watch a favorite television show for the next half-hour while your dog drives himself nuts dissecting his new favorite thing! Soak kibble in plain yogurt/beef broth/anything tasty and liquid until slightly soft. Follow KONG 101 recipe above. Watch a favorite television show for the next 1.5 hours while your dog drives himself nuts dissecting his KONG- sicle! Mix plain yogurt with plain oatmeal to a very stiff paste. Plug large hole of KONG with two medium-size treats, making sure their ends are firmly stuck into the oatmeal mixture. Freeze hard and give to dog. Enjoy your hours of freedom while dog de-stuffs! As this is does not contain the dog’s normal staple diet, this should be a meal replacement only 2-3 times a week or less. When first offering this toy, stuff fairly simply so the dog can learn how to de-stuff. Due to the different size and shape, the dog will need to use different techniques to de-stuff and this takes time. Drill a hole on each side of plastic peanut butter jar that’s biig enough for the food and/or treats to get out. Put 3 toilet paper rolls inside the peanut butter jar to create the puzzle. Add dog treats or dog food. They’ll roll the jar around and work to get the treats out! For dogs who like squishy toys, the Hide-A-Bee by Krygen is great, but costs about $20/ The point of this toy is to get your dog to take out all the bees of the holder. There are squeaky toys in each bee. Cut the felt (or any fabric) into long strips. Wrap fabric around the dog treats. Stuff the fabric in the ball. Your dog should go crazy trying to get to the kibble while pulling the fabric out. This is one of Stephanie’s most popular toys, because one of the most difficult things for people to do is wear their dogs out. It’s very, very sturdy. This thing is just not gonna break no matter what you do. What’s really great is that this rope is elastic so it goes back and forth, and then we get a nice tug toy here at the end , it even has a squeaker in it. The other thing that’s really great is that eventually everybody knows your tug toy gets disgusting and gross and covered with saliva. So they designed it so you can easily slip this off, and then replace your tug toy with something new. You can actually wear your dog out in about ten minutes with this. It costs about $30. Cut PVC to length you need for your dog’s size. String rope through PVC pipe leaving enough slack to tie to PVC pipe and to tie tug toy. Tie a tight knot around the PVC pipe with rope. On the other end of the rope/PVC pipe, tightly tie a tug toy. Here’s where our DIY version isn’t as great as the real thing – once that tug toy gets yucky, you have to cut the rope and tie another one to it. If you have a dog that eats too fast, a trick to slow them down is using a puzzle. They have to learn how to take plastic puzzle pieces out of the tray to get to the food. It’s a pricey item because it’s a very durable puzzle. Distribute your pups meal allotment in the muffin trays. Put a tennis ball in each tray. Make sure the tray isn’t too deep for them to get the ball out. Watch them learn to remove the ball to eat their food. It slows them down while making them use their brain! It’s a puzzle for dogs who like to play fetch. It is very durable and a great chew toy. There are holes on either side so you can stuff the ball with kibble. Drill holes on both sides of the tennis ball. Use scissors to cut off excess felt and rubber the drill may have created. Fill with treats. 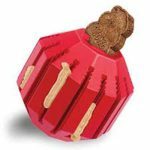 Throw and watch your dog have fun playing fetch while searching for treats as well! TIP: If your dog doesn’t understand how these toys work right away, try to add a treat that has a strong smell. We used Lamb Loaf. The price was $7.99 and you can get it at any pet store. It will make them work harder to figure out the puzzle. In addition to mentally challenging your dog, these toys and puzzles help keep them busy and out of trouble.